Hubba left yesterday for a camping trip to the desert. The day before yesterday I won 120.00 as a sub at Bunco. 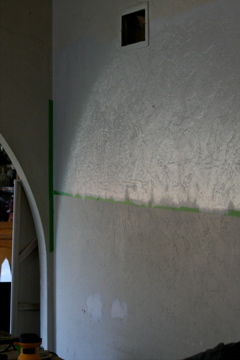 Found moola, and hubba away made for a trip….gave me the itch to re-do a wall in the ol’ hacienda! The people at Ganahl Lumber were a huge help….up to five free straight cuts(nice)on my wall paneling…..the paint guy sold me on egg shell finish….and a painting I did go! Tony got the stuff I couldn’t reach!